We took 12 Cubs who all enjoyed the Wave sessions, Inflatables and Water Slide, going from one to another. The Cubs also played volleyball in the water with the Leaders. Needless to say, the Cubs were all thoroughly exhausted by the time they had to leave the pool. 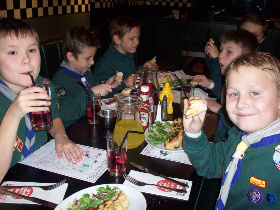 The afternoon ended with tea at Buddies American Diner, which is always a favourite with the Cubs, especially as they sit away from the Leaders and place their own orders with the waiting staff. Once again, we were complimented on how well behaved and well mannered the Cubs were.